Traditional gravy made healthy. This gravy can be made Gluten-Free and Dairy-Free. Any way you make it, this gravy is full of blended savory onions and garlic for added flavor, not to mention onion and garlic’s awesome health benefits. This recipe is the closest to a traditional gravy that most people are used to which makes it so easily accepted so I would call this a Step 1 gravy recipe. Step 2 would be my Creamy Onion Mushroom Gravy recipe. It is similar to this recipe only I use mushrooms to thicken the gravy instead of oat flour. Step 3 gravy recipe is my Condensed Cream of Mushroom Superfood Soup or Gravy as it is the best for health and nutrition. It is similar to my Step 2 Gravy recipe only it has cauliflower added for extra thickness and goodness. Remember its better to transition yourself and your family gradually so that you really enjoy your food in the process. Only you know where you are at in this process. If you are unsure, start with recipes that are closest to what you know and graduate from there. This recipe makes 6 cups. If you’re making this for a family or group larger than 6, consider adjusting the recipe to make more because it tends to be popular and goes really fast. And besides left-over gravy pairs nicely with just about any other left-overs. This recipe makes 6 cups because I originally figured 3 cups would do it but found that it just wasn't enough for my family of 6 so I ended up doubling it. Left-over gravy will get used up the next day for sure. It goes great over eggs for breakfast, over vegetables, in soups etc. ½ cup oat flour (Gluten-free if needed) or unrefined flour of choice like brown rice flour. 4 cups of wMilk of choice (any nut milk, rice milk or coconut milk) (vegetable or chicken broth may be used here, it just wont be as white and taste the same as traditional white sauce but still good) I prefer to use 2 cups of almond milk and 2 cups of chicken broth. Sauté onions in coconut oil on low/med heat for 10 to 12 minutes in a med-large pan, until the onions are soft and tender. Keep the heat low enough that they don't darken too much. Don't rush this step; it makes all the difference when the onions are cooked slowly and well cooked. Add the chopped garlic and continue to sauté for a few more minutes. Add ½ cup coconut oil or butter or a combination of both and let them melt. Sprinkle the flour into the pan, whisk or stir together. Then add the salt and pepper. 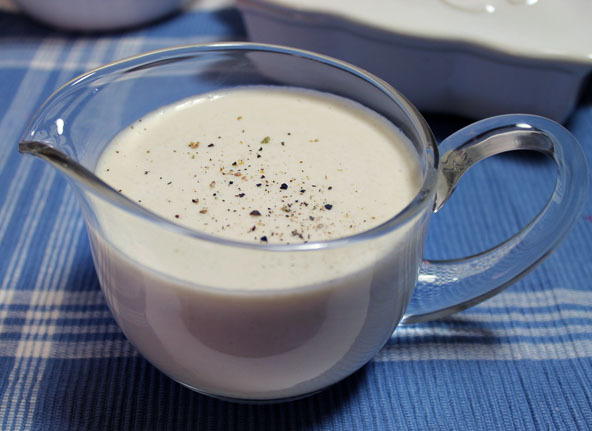 (Hold the pepper if you are making white gravy for Sweetiepie Meatloaf. Sauté for an additional 2 to 3 minutes to cook the flour. Add in half (2 cups) of broth or wMilk of choice and stir together. Pour this mixture into a blender and blend until smooth. Then pour this mixture back into the sauté pan. Add the other half (2 cups) of broth or wMilk of choice and sauté uncovered for 4 to 5 minutes while continually stirring as it boils lightly and thickens. Serve while its nice and hot.